Last weekend was a pretty exciting one for sports: the Lakers won the NBA Finals, and the Penguins took the Stanley Cup from the defending champion Detroit Red Wings in enemy territory. Doesn’t get much better than that. And while everyone here at Upper Deck has their favorite athletes and teams (especially those who came here from areas other than San Diego), we all find ourselves cheering for athletes who work with our company. 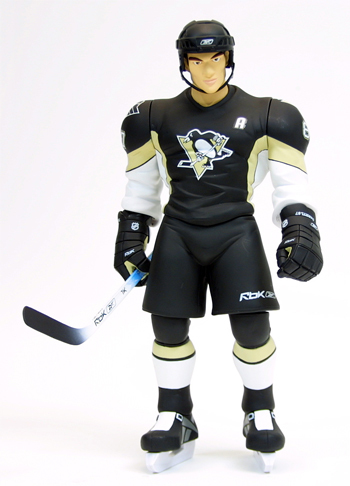 Like Kobe Bryant and Sidney Crosby. So right after Marc-André Fleury made those incredible saves in the final seconds of Game 7 to bring the Cup back to Pittsburgh, I immediately knew what this week’s Brag Photo had to be. 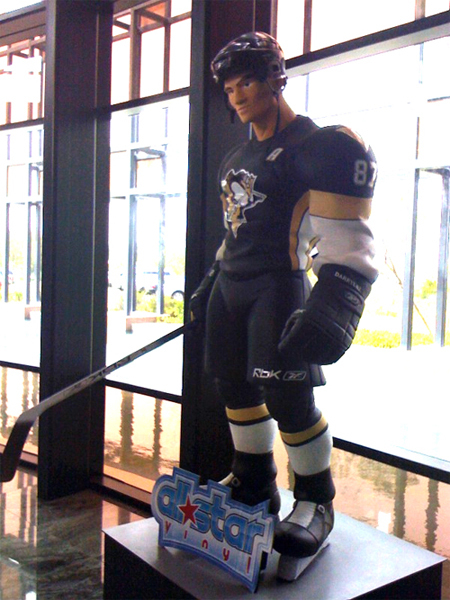 Behold: the giant Sidney Crosby in our lobby! Sidney is actually located right by the steps to the second floor, so if you work up here (as I do), you’ll see him first thing in the morning, and at the end of the day on your way home. Being that it’s an Upper Deck item, no detail is too small. 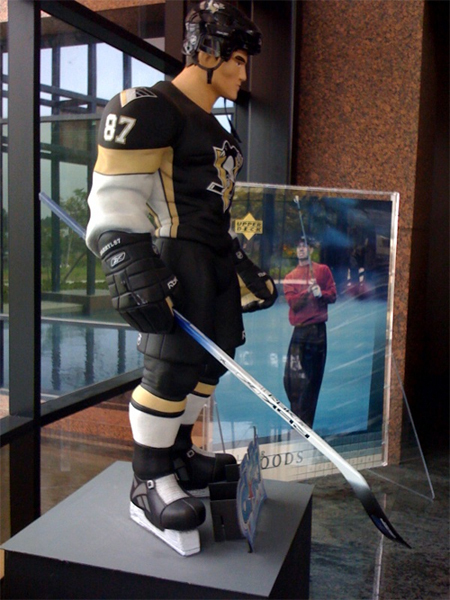 If you spotted the sign on his base, or are familiar with Upper Deck products, you’ll notice that this Sid the Kid is actually a much larger version of the All-Star Vinyl product that also bears his likeness. I can say with a good amount of confidence that you’re unlikely to ever obtain this giant one that greets us each day, but luckily the market version is just as detailed, and can fit comfortably on your desk without crushing it. 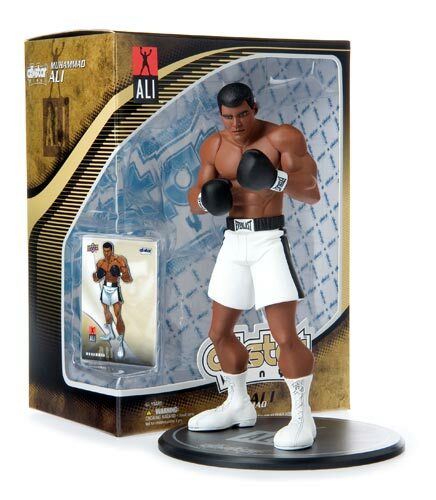 I’m not aware of any current plans for a giant Muhammad Ali, but if we did produce one, the champ would provide me with deep inspiration to come up with great one-liners on a daily basis. A boy can dream. 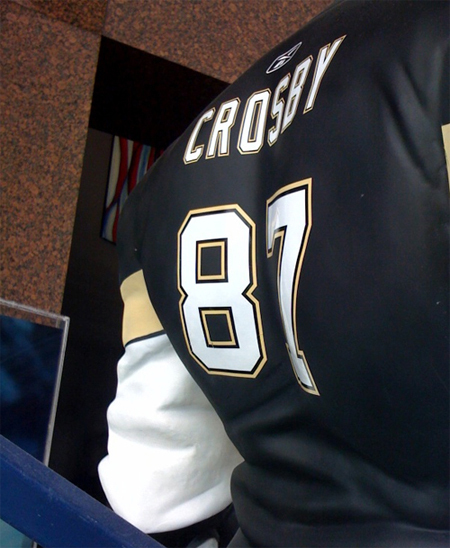 Keep visiting every Friday for more Brag Photos: even though we have lots of cool items in the warehouse, the game-used room or deep in the vaults under lock and key, some of our most unique items like the Giant Sidney are in plain sight on a daily basis. You’d normally only see these if you’re an employee, a visitor or a lucky sweepstakes winner, but I’ll be showing them off right here on the blog.